Female expat living in Uzes travels to Nimes and Pont du Gard for fun and learning – Join the Barefoot Blogger on Facebook, too! “Someday you’ll be glad you’ve seen this,” was the theme of a recent tour of Nimes and Pont du Gard with my 10-year-old visitor, McKenna. As spectacular and amazing as seeing an ancient Roman aqueduct or coliseum might seem, most children would rather spend the afternoon at the pool, or at the Haribo Bon Bon Museum. 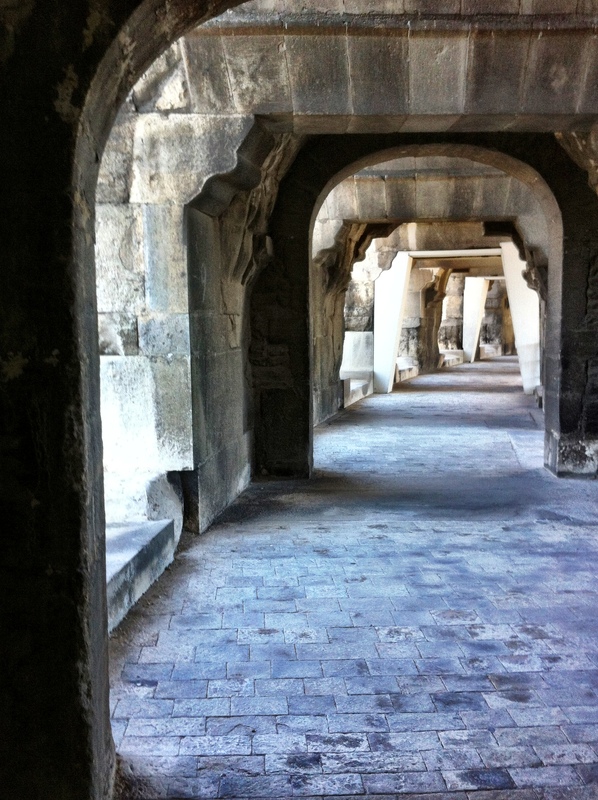 I’m not saying that McKenna didn’t learn something from the narrative film at la Maison Carrée — the centerpiece of the historic district of Nimes — or from walking where lions and tigers entered the arena. She definitely took it all in. Now that she’s back in the States she is sharing the stories with all her friends. If the truth is told, I’m guessing her favorite part of the day was cooling off in the sparkling clear waters of the river below the Pont du Gard. 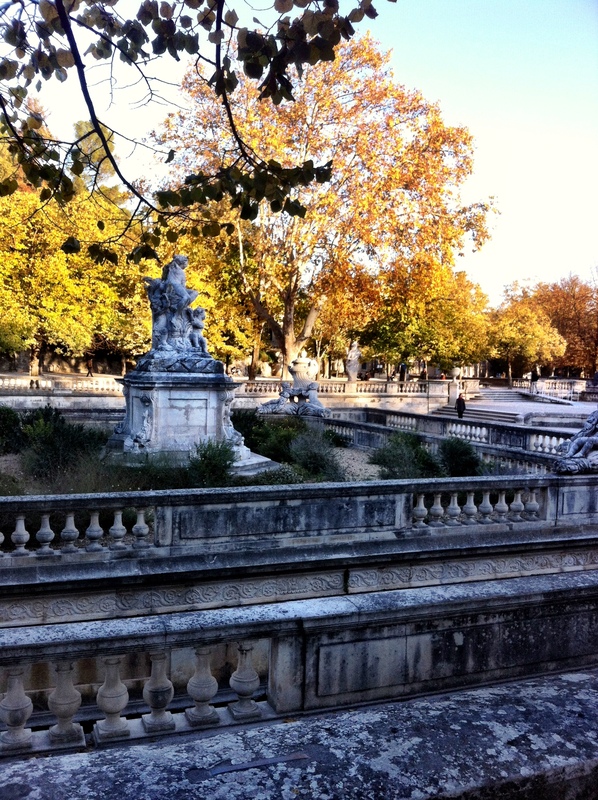 Another favorite spot for the active 10-year-old was the Jardins de la Fontaine in Nimes. Somewhere among the ruins of Diana’s Temple, she found a playmate. Climbing on the pediments of the first century monument dedicated to Augustus, or exploring the vaulted ceiling rooms might have been McKenna’s best memory of the day if we adults hadn’t been in such a hurry. I guess we just don’t get it. Anytime I take a trip in France and walk among ancient Roman ruins, I am thankful to the French. In French towns and villages where the Romans used to roam, you can actually see, feel, touch and experience the places of the past. There are arenas, forums and amphitheaters in the center of towns that are as active today as they were 2000 years ago. You can climb on and over the walls, paths and steps where Caesar’s men walked. You can tread the same routes where early villagers pushed their carts and lead their horses. Thank you for enabling us to re-live, revere and learn from those before us. 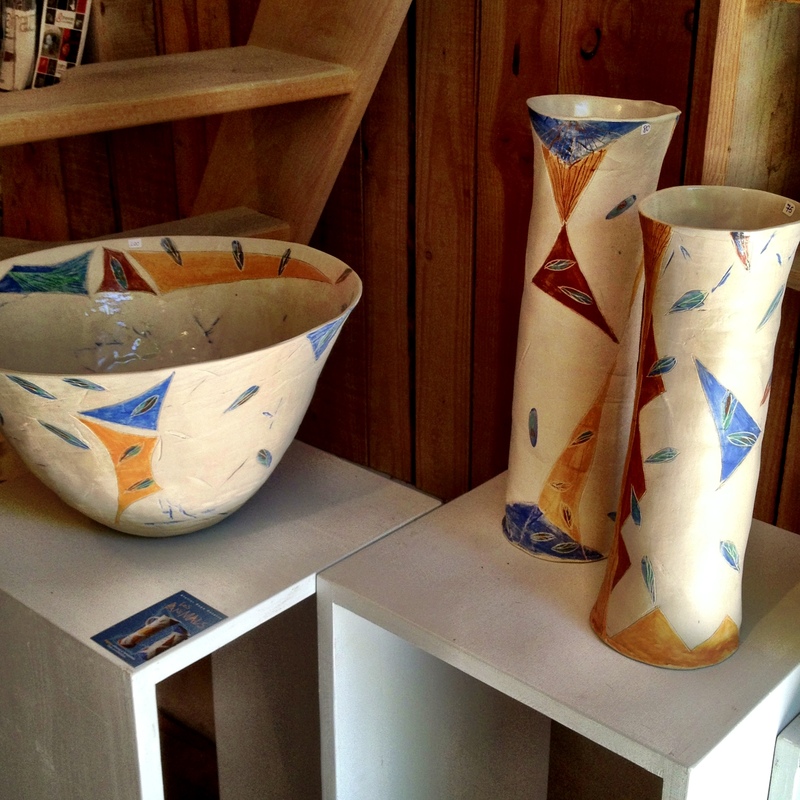 Thanks to Pete Bine for contributing photos for this post! Before I ever dreamed of living in France, I had this wild idea about visiting Nepal and Kathmandu. Now it seems even my craziest thoughts are coming to life. Let’s just say I had put this trip planned in 2011 on the back burner. Then I learned I was going to lose the deposit if I postponed it again. So I decided it’s now or never. Nepal here I come! Now that the trip is almost a reality — November 25 — I have to get in shape. Then there were my new friends who were visiting Uzes from California. Paula and Rich love the outdoors. “Sure,” I said, confidently. Then I followed them up the steep incline… 20 feet or so behind. “Here,” said Paula as we reached the rockiest part of the uphill path. “This might help you keep your balance,” she teased as she threw a stick at me the size of a large tree limb. “You’re a pal,” I gasped, trying to breathe and walk at the same time. I made it up the hill and vowed I might do it again. The training turned serious when my son came to visit a few weeks ago. In his travel bags from the States, he brought me a retractable trekking stick. He was intent on making me get as much exercise as possible. Little did he know that I could show him a thing or two … like the STEPS and the hill at Vallee de l’Eure. Up again … this time with a proper walking stick, which made a huge difference on the rugged path. The biggest test was the trek up the hill at Pont du Gard. It’s not the hill that you climb so that you can see the Pont du Gard from on high. It’s beyond there. It’s the one that makes the Pont du Gard look like an anthill! Yep, I walked that far! Through the hidden wall …. … And some amazing plants I’d never seen. And then … we turned around and went back. This was not the trail to another view of Pont du Gard. We were on our way back to Uzes. No thanks. I’ll drive! Everything new in life starts out just the same. Take one step at a time. My first house guest came to visit recently. 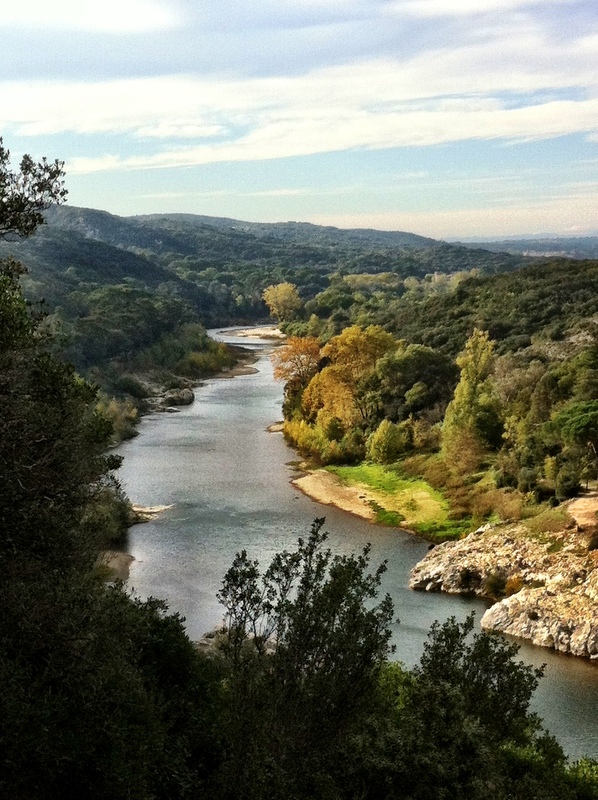 During her two-day stay, my college-aged friend and I visited some of my favorite spots around Uzes : Pont du Gard, San Quentin La Poterie and Nimes. When I learned that my friend from North Carolina’s daughter wanted to visit Uzès in November as part of her break from college, I was thrilled. She is a student at Tulane and is studying a semester abroad in Copenhagen. Through emails I learned my visitor wanted to plan her time around a market day — either on Wednesday or Saturday. Since she reads my blog and she knows how I rave about “markets” she wanted to see one for herself. Plans worked out that she would arrive in Nimes by train on Tuesday evening and return for the train on Thursday evening. The “agenda” we decided upon would give her a chance to go to the Wednesday market in Uzes, and then see Pont du Gard, shop a bit in San Quentin les Poterie and tour around the quaint pottery village. 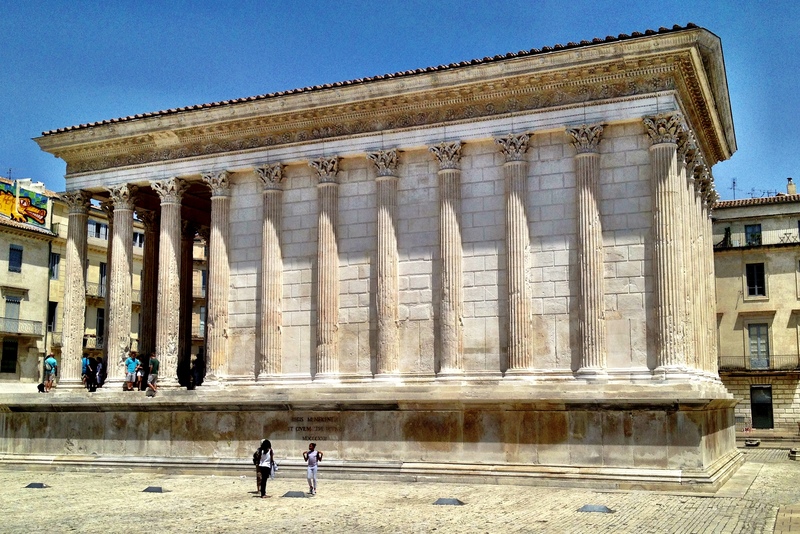 Then on Thursday we would see the sights in Nimes — remains of Roman civilization — before meeting the train in the evening. I was so excited about meeting my visitor at the train that I got to the station in downtown Nimes well ahead of time. The train was delayed but she arrived close to schedule at 7pm. When she stepped off the train to greet me she was more adorable than I remembered. The last time we saw each other was when she was in middle school. After quick “hellos” and hugs, we took the elevator in the train station to the parking lot below. We hopped in Mustang Sally and took off for Uzes — a 40-minute drive along a very narrow, curvy, downhill road. The same route the Tour de France cyclist often travel. 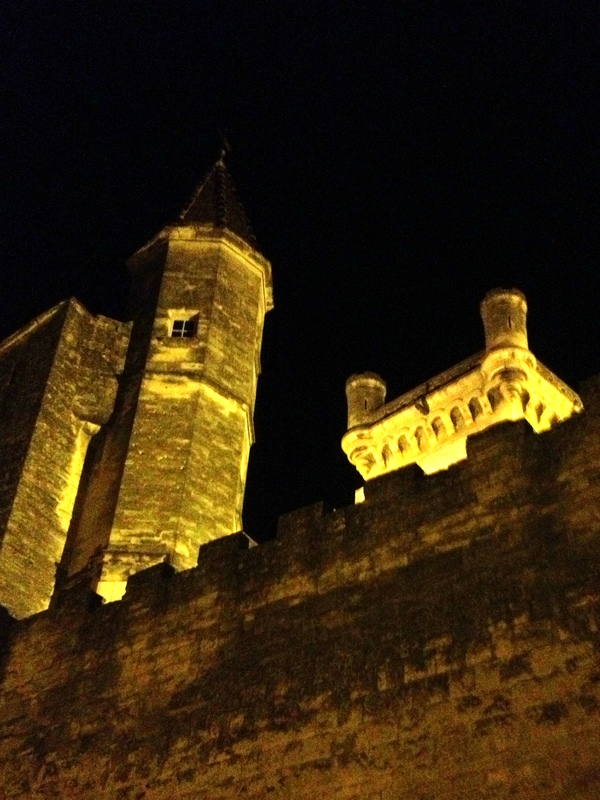 First impressions of Uzes – When we entered the town of Uzes I deliberately drove slowly down the tree-lined street, around the tall cathedral and along the walled passage. I could tell my young friend was taking it all in. Before we got to the main street, I pulled Sally into the almost-empty underground parking lot. We walked up the steps, through the staircase that leads from the garage, and into the fresh air. 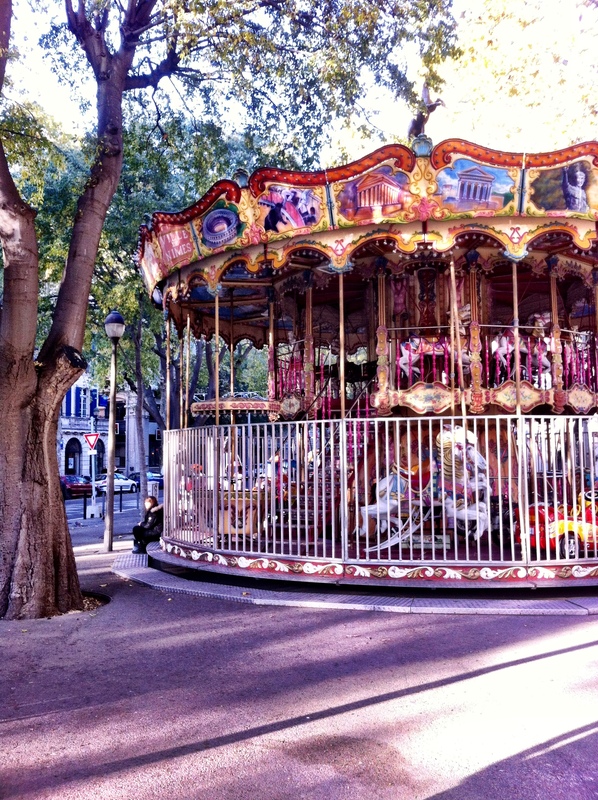 A short walk through a backstreet alley led us to the plaza of the Duche — Place de Duche. “Oh my,” my friend blurted out as we rounded the corner; I knew the feeling. Seeing the Duche, the towers, and the ancient stone buildings for the first time is pretty amazing. When we reached the apartment building and entered the massive entrance door, I led her up the fifty-five steps to my place and to her room for the next few days — decorated just in time for her visit. A room with a view. Rise and shine – Not one to awaken early, I made an exception this day so that we could cram in as much sight-seeing as possible. Our first stop: a cafe for “petite dejuener”. 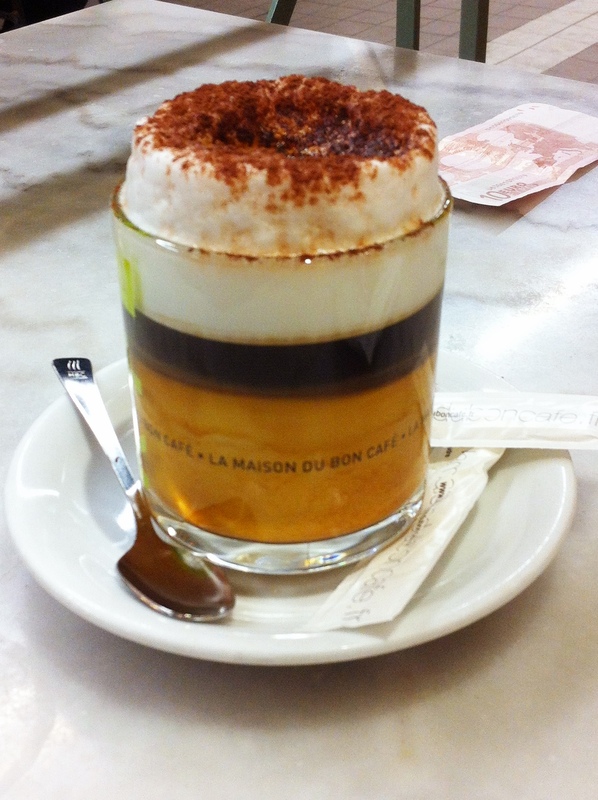 After going by three of my favorite places,we learned that cafes around here don’t serve pastries with their coffee. It is, however, perfectly acceptable to bring in a bag with your own. (You can tell that eating out this time of day isn’t part of my routine.) Happily, we went to the boulangerie to choose from a decadent selection of fresh, hot bakery items. Our choice: croissants — two chocolate, two almond. Then off for coffee and latte at the nearest cafe. 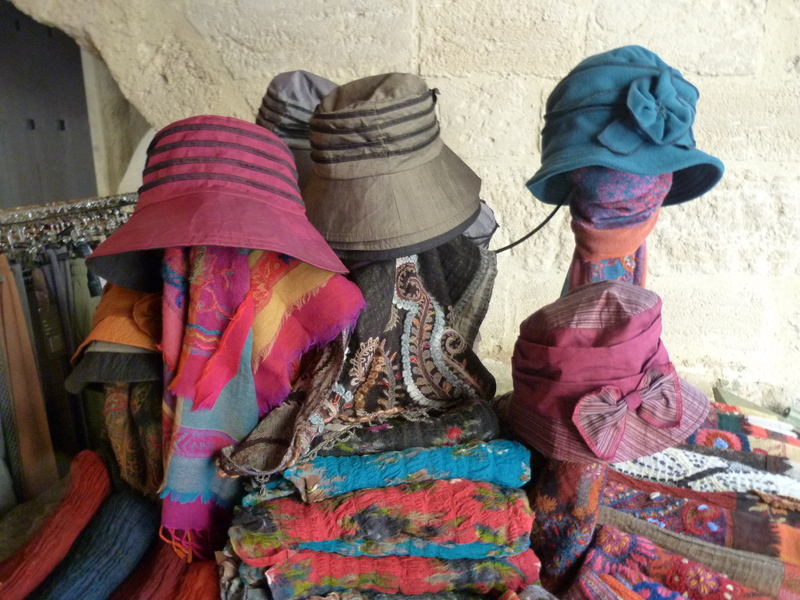 Market vendors and tourists are dwindling down in numbers with the cooler weather in Uzes. Anyway, there was enough activity that my guest could picture the Place aux Herbes crowded with people and things to buy. Shops were open that displayed the season’s new fashions. Wishing she had brought a bigger suitcase, my young friend found a linen, ruffled dress that she could easily stuff into her backpack. 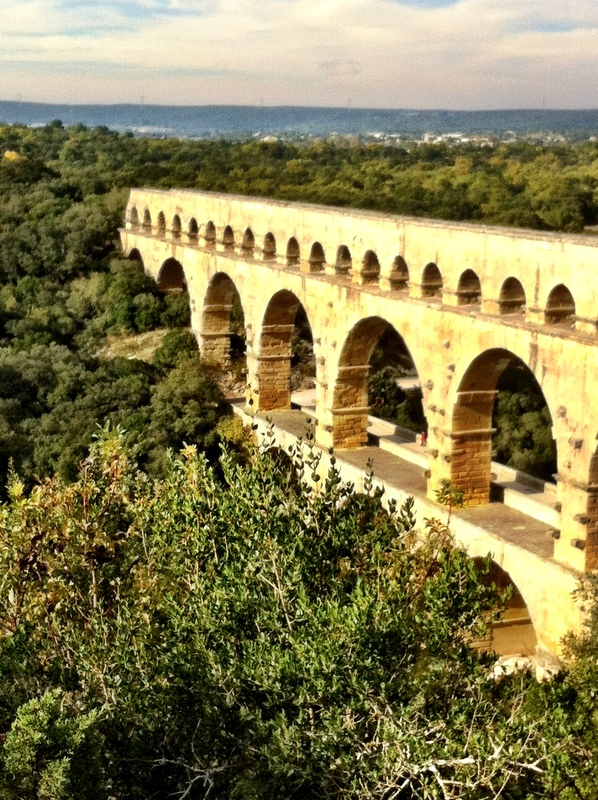 The aqueduct built by the Romans to supply water to the early Gaelic city of Nimes was next on the tour. On the 20-minute drive from Uzes to Pont du Gard, I became concerned about the weather. The sky was cloudy and the wind was ferocious at times. I was a bit concerned about our plan to walk through the expansive, open grounds at Pont du Gard, then across the long, open bridge that is part of the aqueduct. My mind darted back to last summer when, crossing the Pont du Gard, my hat flew off and it almost went over the side. It’s a long way down to the river and valley below. I didn’t want to be a “killjoy” but I related the hat story and added that the wind was blowing much harder now. My companion wasn’t worried at all. She had seen worse in Copenhagen. We forged ahead. There’s a blog about Pont du Gard that I wrote this summer. It goes into detail about my feelings the first time I saw Pont du Gard. I really hoped it would have the same affect on others. I wondered how I would react seeing it again. In the fall, with few visitors in the park, the view of Pont du Gard is still amazing. Right on schedule after a half day at Pont du Gard, there was plenty of time for sightseeing and shopping in the small village on the other side of Uzes known for its artists, pottery and laid-back atmosphere. We accomplished a lot in Day One of the two-day tour, including plenty of time to eat lunch at Pont du Gard, to sip lattes in a tiny cafe/reading shop in San Quentin la Poterie, and to enjoy “mashed cod and potato” pizza at “Pizza les Duche” when we returned to Uzes. The next day was just as busy, filled with visiting more sites of the Roman occupation of Gard. 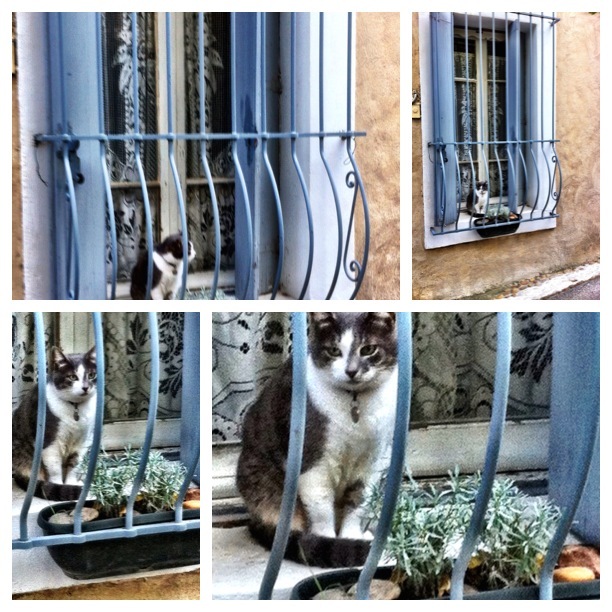 A tour of Nimes. 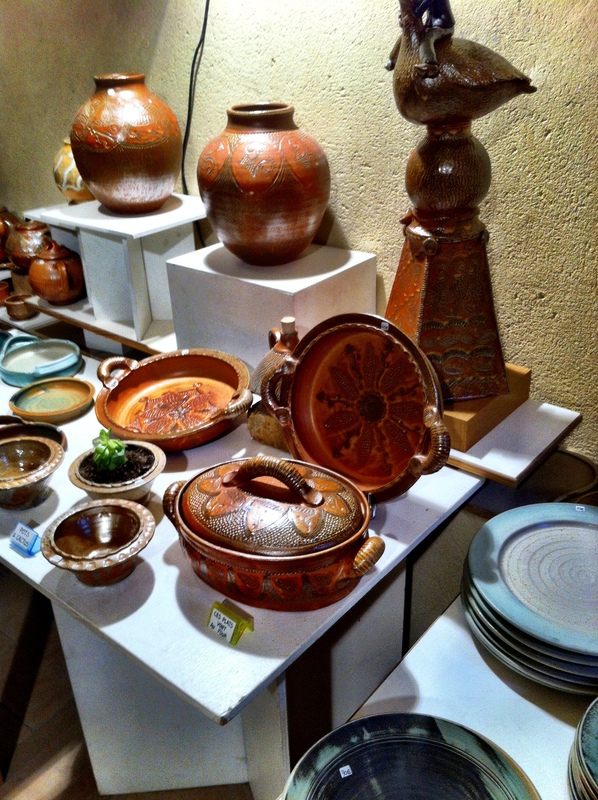 The city of approximately 150,000 citizens, is proudly called the City of Art and History. Its beginning starts over 2000 years ago with many sites dating back as early as 25 BC. To include Nimes on a visit to Uzes is not only a must-see, it’s convenient. The train station is in the middle of the city — the closest around. Trains connect to Paris and the rest of France where you can get most anywhere in Europe. My house guest’s train to Marseilles, then onto Nice, was scheduled for early that evening, giving us time to leisurely walk around the historic town. La Maison Carrée – To me this is the practical place to start the tour. The grand, majestic “forum” is in the middle of downtown. A 20-minute movie plays constantly during the daytime at la Maison Carrée that presents the city and its history in 3-D. It seems a bit “hokey” because the scenes are intended to represent people and events 2000 years ago; however, it’s entertaining. I definitely enjoyed the film more this time than when I saw it last summer. Then there were lots of tourists and I had to sit on the theater steps. 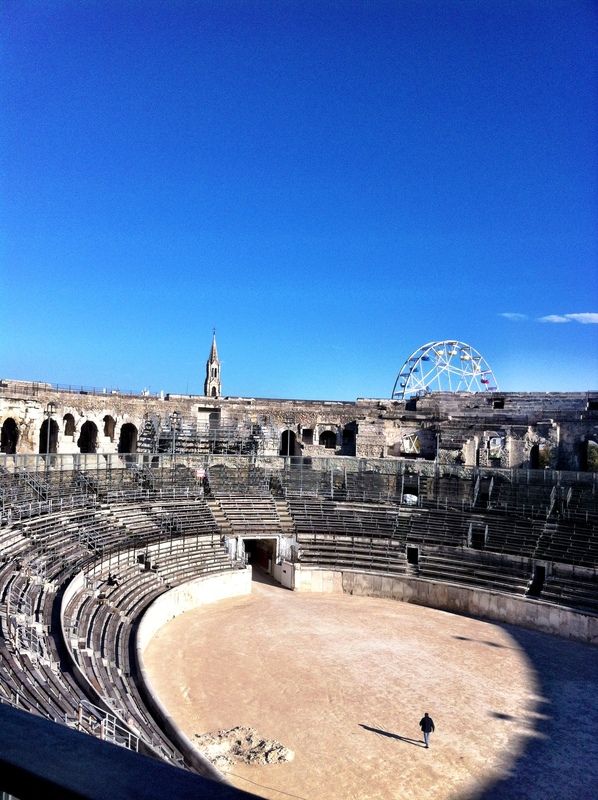 The Arena – Also known as the Coliseum, is one of the most spectacular places to see in Nimes. It is one of the few remaining arenas from the Roman days and, reportedly, it is the most well-preserved. We both agree it is a more impressive landmark than the Coliseum in Rome. 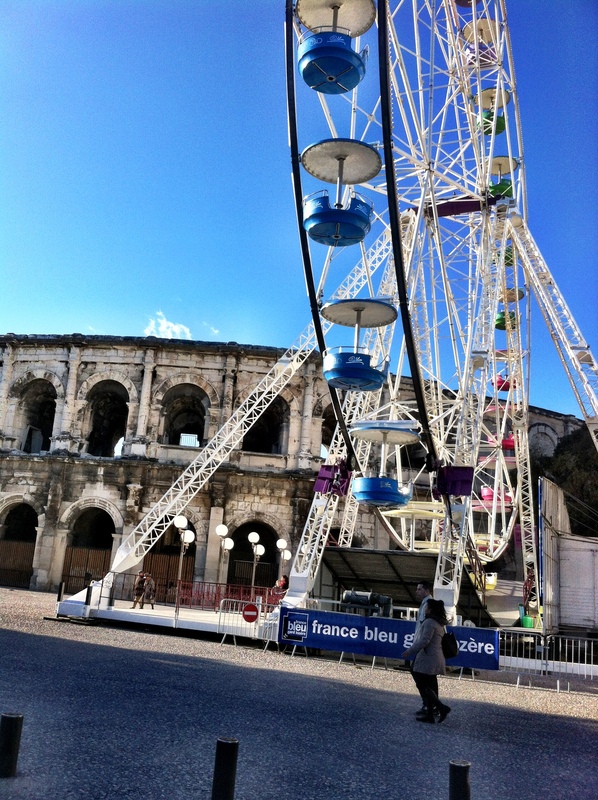 The park-like historic district where the arena sits in Nimes gives the giant structure the space it deserves. Even though it is in the center of town, there are no tall buildings around that hinder the view. Just a reminder that Nimes is a lively, modern town. 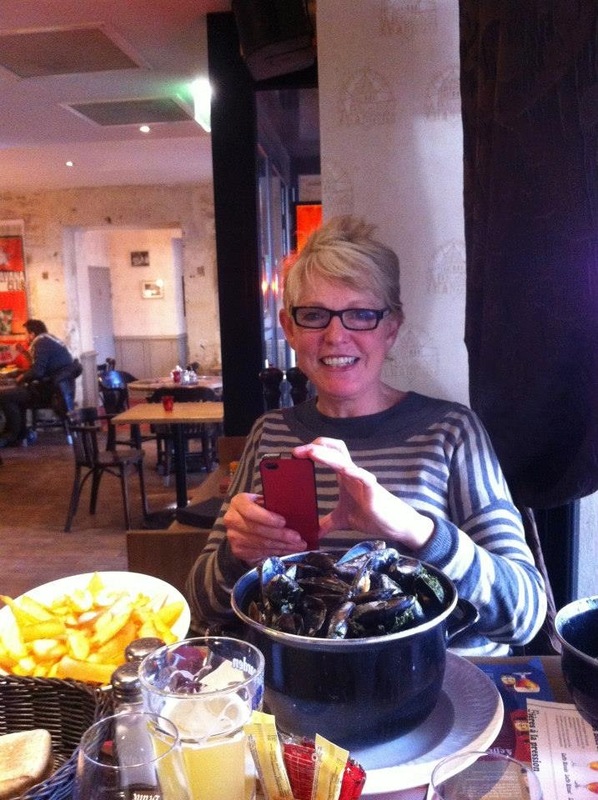 Our lunch stop in Nimes gave me a chance to introduce a local dish to my guest — moules and frites. When I see mussels and fries offered on a street menu as the “plat du jour”, I go for it. To pay nine or ten euros, it’s a good value. Plus, it’s really tasty! Especially with an icy, cold glass of beer from the tap. 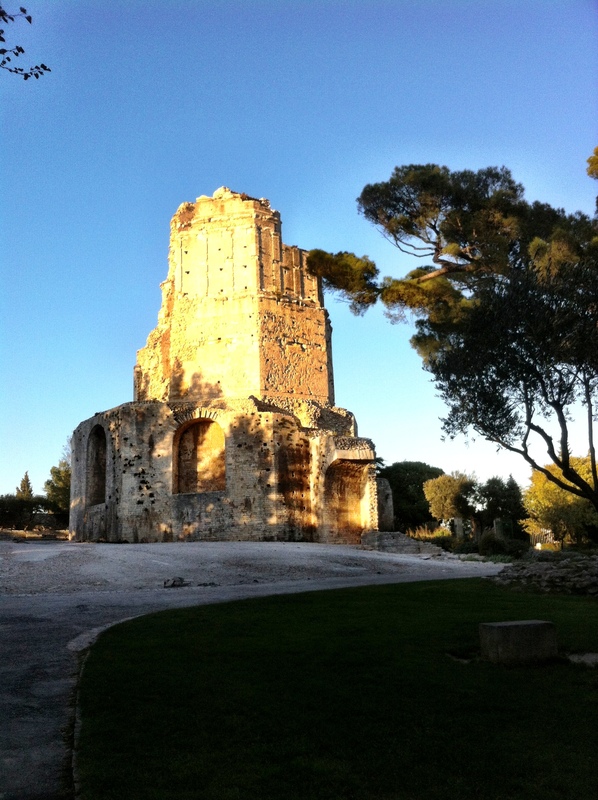 Tour Magne – The Great Tower is at the highest spot in the city of Nimes and the only remaining remnant of the ancient wall built by Augustus near 15 BC. Getting to the Tour Magne is a mission in itself. Standing tall above the beautiful Jarden de la Fontaine, the monument is reached only by climbing the stairways that lead to the top of the terraced garden. The views along the way are magnificent, even in late fall. By the time we reached the monument visitor hours had just ended. Just as well for me since I swore the last time I climbed the stairs of the tower would be … well … the last time. My energetic friend could have easily taken it on, but she assured me she wasn’t disappointed. To see Nimes from this height was quite enough. Missing the climb to the top of the Tower meant we had more time to relax, visit and see other parts of Nimes. It also meant we had time to take in one of the most interesting, amusing spots of all — the cafe near the train station. My guest agreed these out-of-the-way places and people you meet make France the place to spend as much time as possible. The non-stop, three day visit to this part of the Gard in southern France was over.